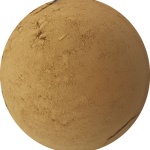 A true matte mineral base powder foundation that lasts ALL DAY! Extremely lightweight yet provides perfect full coverage. Pure intense mineral pigments without bulking agents so only VERY little is required! Water and sweat resistant. 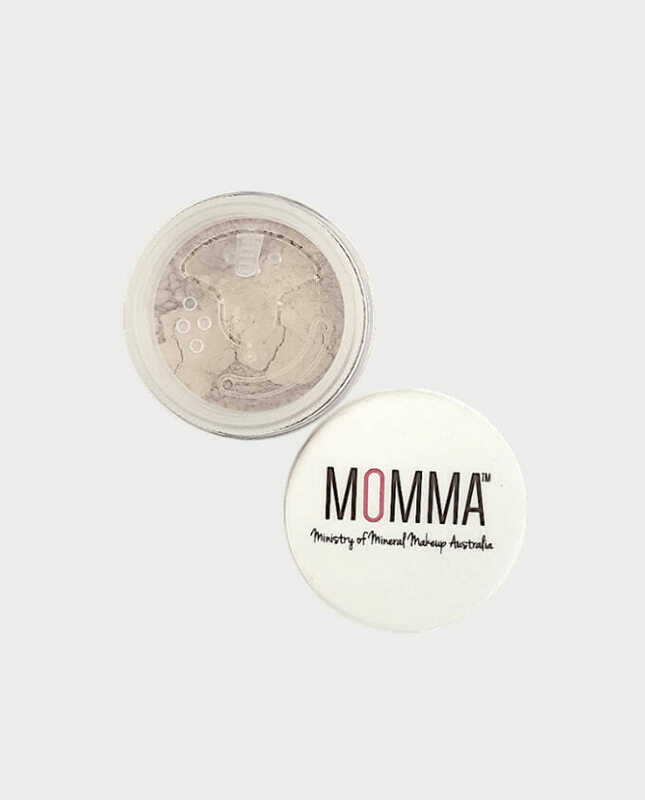 MOMMA Matte Mineral Base Mineral Foundation powder is a full coverage, lightweight foundation and does not clog pores. 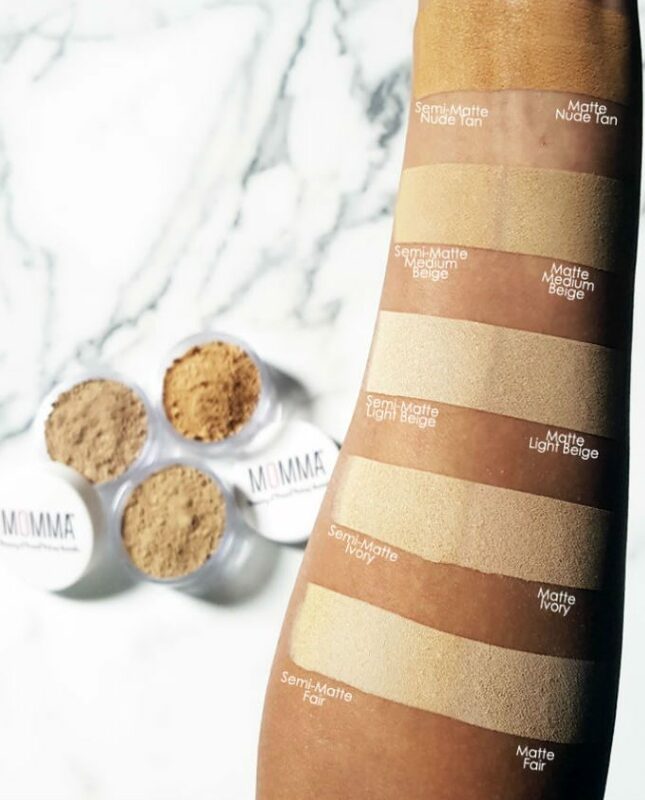 MOMMA Matte Mineral Base Powder is a true matte finish. Customers who prefer a soft, dewy finish with natural light reflecting effects will prefer our Semi-Matte Foundation. Received my order this morning . Love Love Love everything . Am so happy with your products . I look great and feels and looks so natural . Thank you will be purchasing again very soon. Just want to say well done! I gave up on using mineral makeup ages ago as they never ever look right on me. Now I know it was the fillers and talc in the other brands! I’m glad I gave yours a go as now I’ll never use any other product! I love the purity of your ingredients, how it blends so easily and my skin is actually looking and feeling better since I started using your mineral base! Will be trying all your other products!! Thanks! I LOVE it!! It’s amazing how it just lasts all day and I don’t even have to touch up once!! My skin looks and feels silky even at the end of the day. Not sticky and caked like everything else I tried. And I absolutely LOVE LOVE LOVE the Flat top brush! Just love it! Thank you MOMMA!! AMAZING! Have completely been converted to mineral base over liquid foundation! 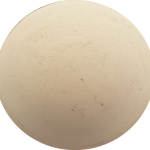 This lasts all day, looks very natural and smooth and my skin has had no breakouts or reactions. Wow! This is so easy to blend and feels so light and silky. My face feels light even at the end of the day. A little really does go a long way and I don’t even need to touch up once through out the day!! Will be trying out all your other products! WOW! seriously in love with these samples that I’ve just purchased more. Not only does my face feel fresh and weightless with this mineral powder, but its also made me look 100% better then normal chemist makeup brands. This makeup is so cheap for what its really worth and as a extremely impressed customer I value that i can access this makeup without the big price tag! Cant thank the creators of Momma enough! LOVE LOVE LOVE! I just received my Matte Mineral Foundation in Ivory and it is PERFECT! perfect colour match, flawless finish, and so far has stayed on very well!! I’ve always been hesitant, and never liked Mineral Foundations but I really like this and it gives me a good medium coverage, but still natural so, so impressed! This product is amazing! I love it so much and I would highly recommend it to all of my friends. Momma, I do so love getting parcels in the mail from you, fabulous product at great prices, keep it up! Thank you! Finally a mineral foundation that doesn’t turn me into an Oompa Loompa! 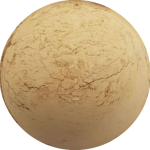 I’m so incredibly happy to have finally discovered a mineral foundation that suits my fair, cool-toned skin!! I had given up on ever finding one that would not turn me orange years ago after trying several bigger name brands. I do have oily skin, so a good primer is needed, but it is so nice to wear. My skin can still breathe and it wears fairly well (I’m still learning the best way to use it and get the longest wear between needing to oil blot and reapply a light dusting). I have bought makeup from Momma and I am very happy with the result. I have bought the powder foundation in medium beige and it is very good. It felt like I have nothing on my face. It helps cover pimples and also avoids making skin dry. I have also purchased lipstick and I am so in love with it, gives an amazing natural look. I love it!!!!!! Iff you dont LOVE this product. Then your crazy! The only makeup I love ! 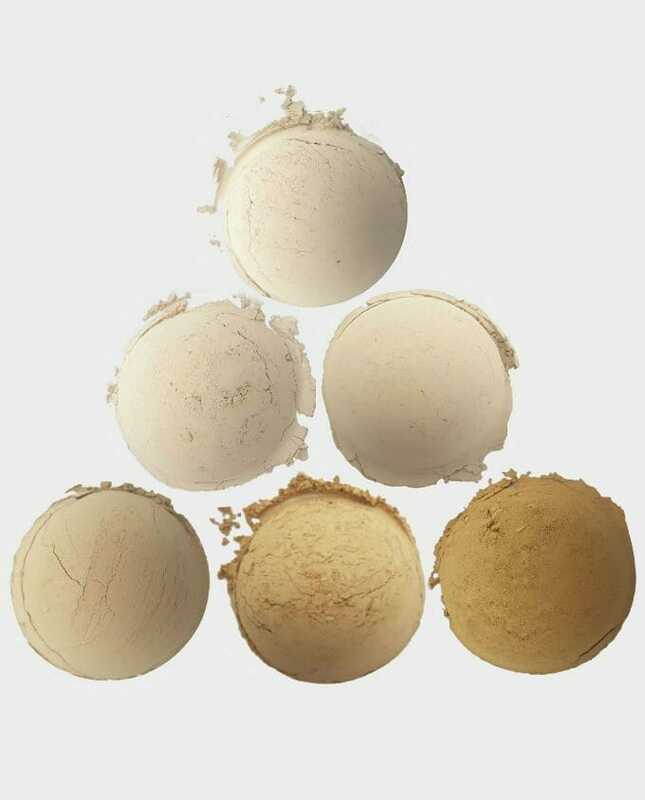 I have used many many different mineral foundations etc and yours is definitely the best! And I loooooooove the jojoba lip butter! 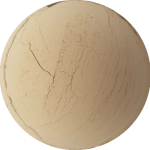 I was hesitant to buy this product at first as I wasn’t sure if it would match my skin tone or provide substantial coverage (as I have tried many mineral powders before and the cheaper versions always disappoint; however, I absolutely love this foundation. I use it over the top of another base to give me colour and higher coverage and it matches me perfectly. Holds well over time and looks very natural. Very good value for money, I would highly recommend!! I cannot rave enough about this product. I discovered Momma a couple of years ago and will not use any other make up. The mineral foundation is not only the best foundation I’ve ever used, but it’s one of the cheapest. I used to buy products various vegan/cruelty free products which would cost a fortune and have useless coverage. I quickly brush it over my face to even out my skin on a day to day basis, or for heavier wear I will build it up for more coverage. Either way it does the job perfectly. On top of that, the MOMMA team are the loveliest people who look after their customers and are so helpful. Best company ever! I love you guys!